Lying just north of the equator, the Celebes Sea is the center of the most biologically diverse area of the world’s ocean. 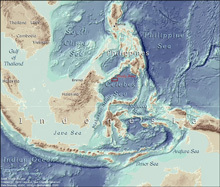 Our expedition will begin in the port of Manila (top center) and take us south through the Sulu Sea to our study site, southeast of the Sulu Archipelago, where the bottom falls off abruptly to the sea floor thousands of meters below. In comparison to the Celebes Sea (the 500-kilometer scale bar on the map would easily lie inside the basin), our study area is relatively small, but we hope that our discoveries will stimulate more extensive exploration and research in these fascinating ecosystems. Click image for larger view and image credit. On October 4, participants on Exploring the Inner Space of the Celebes Sea 2007 passed through the Sulu Archipelago, which divides two ecologically important large marine ecosystems: the Sulu Sea and the Celebes (or Sulawesi) Sea. As part of the "Coral Triangle," as it's called, this is one of the globally important Priority Conservation Areas in the Sulu Sulawesi Marine Ecoregion of the World Wildlife Fund (WWF) because of its outstanding biodiversity characteristics and also because of the high level of threats to this biodiversity. Tawi-Tawi is near the southwest end of the Sulu Archipelago, between 5º and 6º N Latitude and around 126º E Longitude. It is a complex of about 307 islands, 88 of which are characterized by extensive coral reefs, with an estimated population of more than 300,000. Our precise research area in the Celebes Sea was determined by the permits we could get, not only from national Philippine agencies, but also from local municipalities and provinces. The mayors of two Tawi-Tawi municipalities, South Ubian and Simunul, and the provincial government granted us local permits, so we will explore the deep waters extending out from these two municipalities southward into the Celebes Sea. Historically, Tawi-Tawi is known to be the first seat of Islam in the Philippines, since Muslim missionary Sheik Karimul Makdum established the first mosque on the island of Simunul in 1380 A.D. The area is predominantly inhabited by the Sama, Tau-Sug, Badjao and Jama Mapun tribes that constitute about 95% of its population. Politically, it is part of the Autonomous Region in Muslim Mindanao and headed by a governor, Hadji Sadikul A. Sahali. Historically part of the Sultanate of Sulu, Tawi-Tawi became a separate province on September 27, 1973. It is considered to be the most peaceful province in the whole of the Autonomous Region in Muslim Mindanao. As part of the Sulu Archipelago, which comprises about 25% of the coral reef cover in all of the Philippines, the sea around Tawi-Tawi is very rich in marine biodiversity, but it is also threatened by dynamite and cyanide fishing. Because of these challenges, the World Wide Fund for Nature Philippines, through USAID funding, started the Coastal Resources and Fisheries Conservation Project in Tawi-Tawi four years ago. Its goal is to have diverse, healthy and productive marine biodiversity, with sustained socio-economic benefits for Tawi-Tawi. This will be achieved through establishing and/or strengthening management of Marine Protected Areas (MPAs) in Tawi-Tawi. The provincial government of Tawi-Tawi operates from the white building on the hillside between Bongao Peak and the coastal community. Houses along the water are built on stilts to keep them dry at high tide. Image courtesy of 2007: Exploring the Inner Space of the Celebes Sea. Another USAID funded initiative is the Fisheries Improved for Sustainable Harvest (FISH) Project in the municipalities of Bongao, Simunul, and Panglima Sugala. The coastal areas have been subject to overfishing and destructive practices of blast and cyanide fishing. Members of the community are being educated about the long-term adverse effects of destroying the reefs. They receive hands-on training in more sustainable traditional and indigenous fishing practices, with the goal of increasing fish stocks by 10% in 10 years, using a 2003 baseline. The FISH Project focuses on community leadership training; ordinance and policy formulation; and strengthening enforcement in managing the communities’ coastal resources. The FISH Project also conducts extensive information and education campaigns about sustainable fishing practices. Thanks to the efforts of USAID, the World Wildlife Fund for Nature Philippines, and the FISH Project, nine MPAs in Tawi-Tawi have been created to enhance biodiversity and the health of fish stocks. The MPAs are delineated by buoys, and guard houses have been built for the coastal law enforcement teams. Management plans are being formulated with the participation of the community. Stakeholders have established management boards to monitor these MPAs. The boundary markers for the network of MPAs were unveiled in a ceremony on August 30, 2007. The official declaration establishing the network in Tawi-Tawi Bay was signed in the presence of U.S. Ambassador to the Philippines, Kristie Kenney. In this ceremony the Marine Environmental Protection and Conservation Fatwah (a Muslim guideline based on teachings in the holy Koran) was turned over to the municipalities of Tawi-Tawi for their implementation. The Fatwah had been formulated in English by the ulomas (learned Muslim preachers) of Tawi-Tawi, led by the Grand Mufti, Tawi-Tawi’s highest Muslim authority, and then it was translated into the local dialects. With the support of Muslim religious leaders, government agencies, and community stakeholders, these conservation efforts should be a major force in protecting the rich seas surrounding Tawi-Tawi.